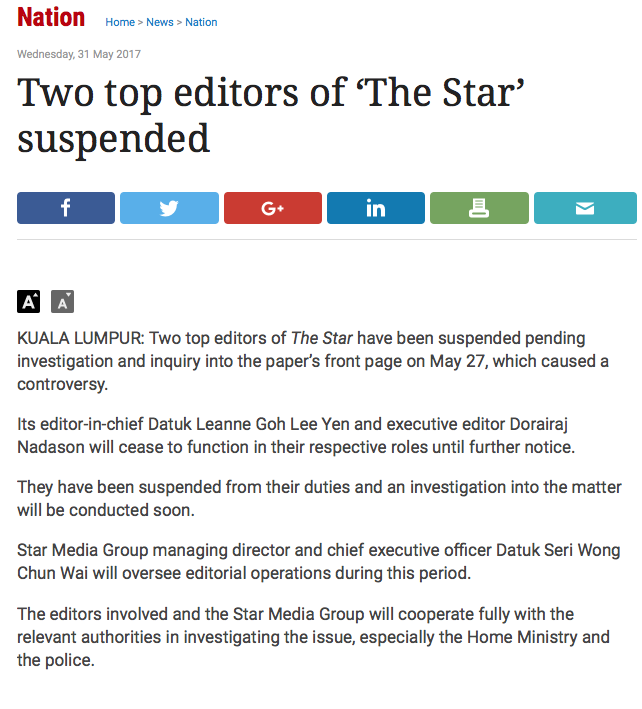 Puchong, 31 May: Most of us didn't think any action would be taken to address the latest in the series of headlines and articles spanning years by Malaysia's largest-circulation English daily deemed insensitive and provocative by its Muslim readers. Well, we were wrong. 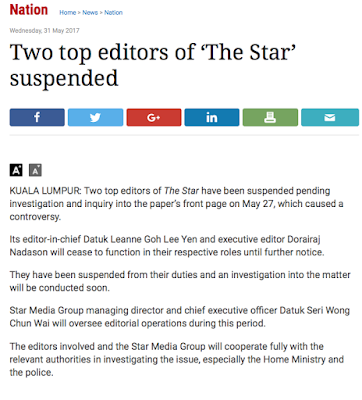 There's a show-cause letter and a probe under the Sedition Act but the sternest action has been taken not by the Home Ministry or the Police but by the management of the The Star itself! The suspension means the newspaper is accepting blame for the insensitive, provocative Ramadan front page. It is admitting that the apology issued after the mess was inadequate, insincere. It also means the management of The Star will conduct a DI to establish what happened, and why. Hopefully this whole episode can serve as a reminder to editors and journalists - including those on the social media - that some values in our unique multi-ethnic, multi-religious relationship cannot, should not be taken for granted. Some will disagree but as far as I am concerned, this is a cue for the KDN and the Police to back off and let the newspaper do its own soul searching. Wong Chun Wai is an old hand. He's been through similar controversies (Donuts and Coffee at the Home Office). I'd give him some room to fix things. Amaran and more amaran fr the talented people up there.